Jaime was a significant contributor to the Oregon-Washington Partners in Flight chapter’s success from 2002-2015. She was an integral part in the development and implementation of the PIF Road Shows that now serve as a national model. Jaime gave presentations on how federal agencies could integrate the best available science into land management planning and highlighted the OR-WA PIF plans. She demonstrated how to use the plans to inform the NEPA process and how to develop management prescriptions for creating desired conditions on the landscape. Jaime led the effort in creating and delivering the science aspect of the sessions and created hypothetical scenarios to engage participants in the PIF process. Jaime has been a passionate advocate for using the PIF Plans to inform management on the ground and continues to work with the federal agencies to implement bird conservation using our PIF Plans. Jaime’s effective communication style was key to the success of these road shows. For nearly 20 years Jaime has managed the Klamath Bird Monitoring Network—one of PIF’s most comprehensive regional monitoring programs. Her management of KBO’s long-term breeding and migration season mist netting program provides invaluable full-life-cycle limiting factor information for bird populations. This dataset represents one of the largest annual data contributions to the continental-scale Monitoring Avian Productivity and Survivorship program. Her other efforts in applied monitoring in the Klamath-Siskiyou Bioregion have been recently entered into the Avian Knowledge Network, making one of the country’s most dense bird monitoring datasets readily available for use by conservation partners. These data have been fundamental to several new and ongoing analyses; of note were the models forecasting bird distributions in the Pacific Northwest in the face of climate change. Jaime has played a strong and critical leadership role in the conservation of oak birds and their habitat in the Pacific Northwest, including several PIF Watch List species. First, she was one of six authors on the definitive regional plan for advancing conservation of prairie-oak habitats and their species Prairie-Oaks, and People: A Conservation Business Plan to Revitalize the Prairie-Oak Habitats of the Pacific Northwest. Jaime represented southwest Oregon and northern California where the largest amount of oak habitat occurs and is core habitat for several PIF Watch List species. In addition to providing expertise on overall concept and review, she lead the development of several components including species recovery concepts, habitat restoration, and climate change. Her extensive knowledge and thoughtful assessment of the best way to present the information was essential as part of the team developing this major product. Jaime has been an integral and valuable leader in advancement of one of the most important programs for conservation of oak birds and their habitat – Quercus and Aves. This program, initiated by American Bird Conservancy, has successfully completed six Neotropical Migratory Bird Conservation Act grants, generating over three million dollars. Jaime provided the conduit and the management to bring in partners and locations in southwest Oregon and northwest California based on her extensive network and knowledge of the best opportunities. This resulted in habitat restoration on several critical properties for conservation of bird species, especially Oak Titmouse, a PIF Watch List species. She also co-led and authored the two most important products for oak bird conservation in the Pacific Northwest as part of this program, as described below. The Land Mangers Guide to Bird Habitat and Populations in Oak Ecosystems of the Pacific Northwest is the primary source for information on oak bird conservation and has received much acclaim as the go-to document for both scientists and land managers. Jaime’s combination of skill to manage, analyze, and interpret data (science) along with her skill to understand how to present results in a way that is palatable and meaningful to land managers and land owners made this document a huge success. Land Managers Guide, OakBirdPop. This web-based, interactive, cutting-edge tool will take the next step in bird conservation by providing users with a means to quantify the population effects and context of their habitat restoration and management actions. Jaime supervised development of this tool which provides an easy-to-use approach that allows anyone to input their data on habitat types, restoration actions, and bird species and receive outputs on the projected changes in bird populations and how those changes fit within the context of regional population objectives established by the Pacific Birds Joint Venture. Jaime has become the foremost authority on using our OR-WA prescriptive Bird Conservation Plans (BCP’s) and assuring the implementing of the recommendations on the ground. 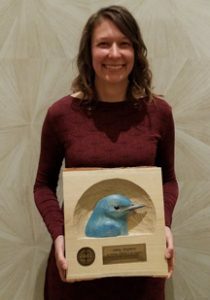 In 2017 she assisted in the writing of a Forest Service Challenge Cost Share Grant for $50,000 to enhance habitats and pilot test the assumption of using birds as indicators of habitat health and restoration success on the Stillaguamish drainage of the Mt. Baker National Forest. Jaime worked with the silviculturalist and others to write prescriptions to incorporate the BCP recommendations to guide understory stand development while retaining an older, over story canopy. The project also includes implementation of an avian monitoring strategy for the treated and untreated areas using bird presence as indicators of ecosystem health. The pre- and post-project avian monitoring study design and implementation was developed and coordinated by Jaime. She also developed the protocol, the data collection and management system and created the GIS study design all while collaborating with the Forest Service and tribal partners. She is currently coordinating and will be providing a one-week training session for the surveyors, developing a spring bio blitz and managing all aspects of the study final reporting process. This project will benefit all the contributing parties by bringing together a collaborative group of agency, tribal, and non-governmental organizations to manage and restore late-seral forest habitats using the BCP’s and PIF focal species approach. The project was funded at the same level in 2018. Through her collaboration with the Klamath Siskiyou Oak Network, and her focus on science delivery, Jaime has helped to secure hundreds of thousands of dollars that has been used to guide and implement science-driven landscape scaled private lands restoration on thousands of acres of at-risk oak woodlands in southern Oregon. She has ensured that the effectiveness of the restoration has been monitored, and that monitoring results have been used to adapt and improve ongoing efforts. This work was highlighted as a conservation success story in two State of the Birds Reports and exemplifies the PIF science-based approach as described in the Continental Plan Revision. Jaime led field efforts, managed analyses, and co-authored papers that were used by the Bureau of Land Management and conservation partners to influence policies resulting in the decision to eliminate cattle grazing within the Cascades-Siskiyou National Monument. This represented direct implementation of conservation actions prioritized in regional PIF plans. Her continued research of grassland and oak woodland species contributed to those species being identified as priorities for conservation in the Department of Interior’s State of the Birds reports. Jaime’s work contributed to the scientific justification for the expansion of the Cascades-Siskiyou National Monument that increased protection for these birds. Her science-based justification, supported by Oregon’s U.S. Senators who recognized the importance of the science, led to the ensuing presidential executive order expanding the Monument’s boundaries. Jaime chaired the Avian Knowledge Alliance as it was initially formed. The Alliance eventually merged with the Avian Knowledge Network. Her influence on ensuring the critical roles of non-governmental agencies in science delivery helped to shape what that Network has become today.